OEM Part # 13 71 2 753 070 (13712753070). 2012-2015 Mini Cooper S/JCW Coupé (R58). 2009-2015 Mini Cooper S/JCW Convertible (R57). 2007-2013 Mini Cooper S/JCW Hatchback (R56). 2008-2014 Mini Cooper S/JCW Clubman (R55). GREAT CONDITION,COMPLETE WITH BOTH HOSES AND SENSOR. Manufacturer Part Number: 7555784. Make: Mini Cooper. Year: 2007. OEM Part #13 71 7 552 223 (13717552223 ). 2002-2006 Mini Cooper S Hatchback (R53). 2005-2008 Mini Cooper S Convertible (R52). Part #: 17511524439. 2002-2006 MINI COOPER S/JCW HATCHBACK R53. 07/2004 Mini Cooper (J.C.W.) S Hatchback R53. 2005-2008 MINI COOPER S/JCW CONVERTIBLE R52. Shown in pictures. No warranty on electric parts. USED PART MAY HAVE SCRATCHES. No labor warranty is provided. Pick up at our facilities is available. OEM Part #13 71 7 619 268 (13717619268). 2014-2017 Mini Cooper Hatchback Base, S, and JCW (F56). 2015-2017 Mini Cooper Clubman Base, Base ALL4, S, S ALL4, and JCW ALL4 (F54). 2016-2017 Mini Cooper Convertible Base, S, and JCW (F57). MINI Clubman R55. MINI Cabrio R5 7. Part Number: 1017862S01. 2007 - 2010 Mini Cooper Base/R55/R56 Air filter Box. FITS: 2007 - 2010 Mini Cooper Base/R55/R56. Good used condition air filter box. This is a used OEM air intake cover with MAF for 2011-2016 Mini Cooper Countryman S. 2011 Mini Cooper Countryman R60. No labor warranty is provided. If the part does not fit in your vehicle. not responsible. For larger air duct. Florida Auto Dealers. We have the right to cancel sale if item is not paid within the hour of being accepted. This fee is waived if we send the incorrect item. Warranty is on PARTS ONLY. 2012 MINI COOPER S COUPE. 1.6L Turbo AT. Be sure for what you buy! - it is an electronic part in good condition. - don’t need it any more;. - wrong part ordered;. - doesn’t fit;. - changed you mind;. 2011 MINI COOPER BASE. MINI R56 (10/2005 — 08/2010). MINI R56 LCI (03/2009 — 11/2013). MINI Clubman R55 (10/2006 — 07/2010). MINI Clubman R55 LCI (03/2009 — 06/2014). MINI Cabrio R57 (10/2007 — 07/2010). Florida Auto Dealers. We have the right to cancel sale if item is not paid within the hour of being accepted. This fee is waived if we send the incorrect item. Warranty is on PARTS ONLY. No warranty on light bulbs. No labor warranty is provided. It is in good condition. Item may show light scuffs,scratches or other imperfections as a result of this being used part. What you see in the photos is what you will receive. For smaller air duct. Florida Auto Dealers. We have the right to cancel sale if item is not paid within the hour of being accepted. This fee is waived if we send the incorrect item. Warranty is on PARTS ONLY. Sold as is. Manufacture Part Number does not apply. Same Day Shipping Available! Read Shipping Details! 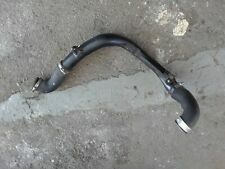 This is the intake tube. This fee is waived if we send the incorrect item. We have the right to cancel sale if item is not paid within the hour of being accepted. Right = Passenger Side. MINI Clubman R55. MINI Cabrio R5 7. Must be in original condition, or it does not qualify. All parts are tested before removal from the vehicle! MESSAGE US FOR ANY OTHER NEEDS YOU MAY HAVE! Part number: 275253. if the part does not fit in your vehicle. not responsible. May fit other models, we are. Standard 90 Day Part Warranty! R57 convertable S 2009-2010. R56 hardtop S 2007-2010. R55 Clubman S 2008-2010. A great opportunity for a Cooper S air intake rubber boot ! This part is vin specific, for the Cooper S model. FERMAN MINI OF TAMPA BAY - MINI ACCESSORIES.